That there is a picture of your friend and mine, our eighth president, Martin Van Buren. Long before he got his trademark white, wispy mutton chops and sly (or perhaps toothless) smirk, he apparently had much redder mutton chops. Other than that, he's not the most notable of presidents—consigned to the ranks of those remembered chiefly through my personal childhood favorite, Yo, Millard Fillmore! You may know that his German pedophilia anecdotally gave rise to the phrase OK, (Get it? Old Kinder hook. Ha ha. Never mind.) or even his role in catalyzing the Albany Regency in New York politics. What's far less known is how he won the presidency in the first place: by defeating a Whig platform in 1836, in one of the strangest campaigns in American history. Well, that and piggybacking on the political career of Andrew Jackson. 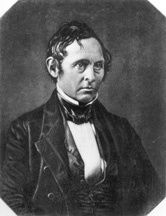 The Whigs were founded in 1833, in response to Andrew Jackson taking a rather liberal view of the powers of the executive branch; thus, it should come as no surprise that the upstarts did not find it necessary to actually agree upon a candidate for the executive branch for the general election. Instead, four candidates—Hugh Lawson White, William Henry Harrison, Daniel Webster, and Willie Person Mangum— ran under the Whig ticket in various parts of the country. The southerners got their act together first, putting forth White as a candidate in 1834; he responded to the speculation by saying that he would run, even though he never wanted to be president, really. Anti-Jacksonians in the north, on the other hand, could not stand White as a general candidate, and wanted fellow senator Daniel Webster, with Harrison as his running mate. Soon, the newly minted Whigs up north decided that it was better for a gun-totin' Injun-killin' general to be president than a platinum-tongued orator after all, and Harrison quickly replaced Webster. As the election neared, it became abundantly clear that the northern and southern factions of the party could not agree on such controversial issues as "states' rights" and "not making complete asses out of themselves in a presidential election", so most slave states had a Whig ticket of White and John Tyler, while most free states, along with the turncoat border states of Kentucky, Maryland, and Delaware, ran Harrison and Francis Granger (who preferred killing Masons to Injuns). Daniel Webster's home state of Massachusetts chose to run him instead of Harrison, and South Carolina, for rather mysterious reasons, nominated Mangum, who looks amusingly waifish in the picture below. Of course, the strategy didn't work, and Van Buren ended up winning fairly comfortably, instead of the regional candidates being able to carve out enough votes to send the whole thing to Congress (although Webster and Mangum both won their one state—perhaps the Whigs would have won if they had tailored a specific candidate to each and every state). In one final twist, Democratic electors from Virginia refused to support Van Buren's running mate, Richard Mentor Johnson (who is said to have killed Tecumseh under Harrison's command), putting him under the 50% threshold needed for a vice presidential candidate to be all well and good. 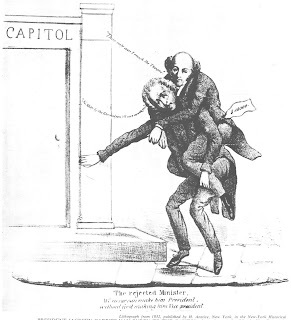 Thus, the vice presidential vote was thrown to the Senate to choose between Johnson and Granger to serve with Van Buren. Clearly lacking a wicked sense of humor, they chose Johnson, who could proudly take up his mantle in the White House as the economy collapsed around him and the new president. The Whigs were able to get their act together, but never really got far in presidential politics. Their only two election winners both died in office, as did the party soon after Millard Fillmore's presidency. This kind of bitter factionalism led to the even more complete split of the Democratic Party in 1860. The hardy Whigs, however, maintained the pretense of standing for something other than hatred of Jackson, and stuck it out under one roof. Moral of the story: hold a national convention. It helps.